For over 60 years, Alside has been manufacturing windows and siding for Texas homes. Now a national company, Alside offers sturdy stalwart materials that can stand up to the elements, particularly the kind of sun and storms that savage homes in Southern states. They’re a nice choice for homes looking not only for decoration, but also a protective covering. This guide will take you through the ins and outs of this brand, to help you decide if Alside is the right product for you. Alside’s cladding comes in two materials: traditional vinyl and variegated steel covered with an outer coating of PVC to match the look of milled wood. The latter is recommended for homes in areas prone to high winds or hurricanes. Either material can be purchased in horizontal clapboard, Dutch lap, or vertical styles. Their specialty vinyl collection also houses a polymer line that can be bought as shakes, shingles, or scallops for a slightly different look. They also provide an insulated line with a 1.5 inch foam backing for households that want to reduce their heating or cooling costs. If you’re going with the steel line, safety is obviously your first priority. You’ll have only a handful of colors to choose from, which are naturalistic tones made to match stained wood. The vinyl side of the brand, however, comes in a much wider color palette including an “Architectural Color Collection” that is available in deep tones like hunter greens and charcoal. This makes them distinctive among vinyl siding brands as many do not offer their product in anything darker than sandstone for fear that the boards may absorb too much of the sun’s heat and warp. Generally, their offerings are sturdy standard selections that will get your home clad without too much fuss. They offer simplicity in their lines– just a few options, instead of a massive catalog of colors and styles. 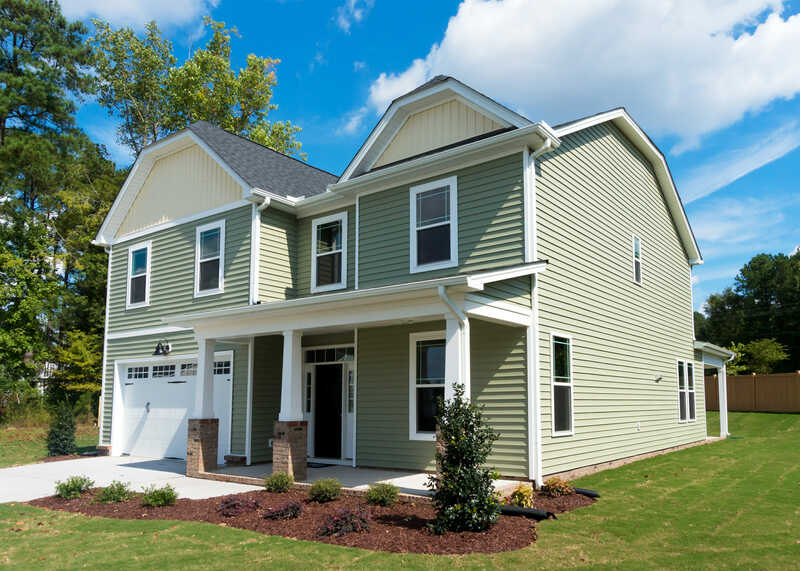 Insulated vinyl siding gets environmental points for energy efficiency–anything you can do to prevent heating and cooling leaks helps reduce energy use. Meanwhile, many professionals consider vinyl to be a greener alternative to other claddings because it is recyclable and because it doesn’t contribute to deforestation. Using vinyl also gives a home points towards its LEED certification, an industry standard granted to homes using green building practices. Like almost all siding brands, Alside offers customers a lifetime limited warranty– and its steel products boast a 50-year hail damage provision. Meanwhile, hail damage and fading is also covered in their vinyl policies as well, making them a good choice for those homeowners located in states that experience a variety of extreme weather conditions. Otherwise, only manufacturer defects are included in their coverage– other weather events may be excluded. Just like all vinyl brands, homeowners with Alside siding need to pay attention to maintenance— namely, how they clean the cladding. Vinyl is a somewhat delicate material that can be damaged by improper cleaning practices. Power washers should not be used; instead clean the surface using a hose and a soft-bristled brush. Alside also recommends a mixture of powdered detergent, household cleaner, and water to take care of any mold that has appeared on vinyl siding. If you factor in installation costs Alside siding costs anywhere between $3.00 and $7.50 per square foot, putting it somewhere in the middle in terms of median costs for siding. Of course, that’s just an estimate– prices may vary depending on your area and your contractor’s fees. Alside reacted fairly well in testing performed by consumer review organizations, generally holding up through a variety of conditions. Cold seemed to pose the greatest issue, however overall, their siding still earned fair marks for withstanding cold weather. Users rated it highly as well. Alside is a sturdy, high-performing option for homeowners that experience extreme weather conditions, particularly high sun and hurricane force winds. If you’re looking for a vast array of details or a dazzling color palette, however, you’ll have to look elsewhere. Still, their variegated steel siding especially makes a nice option for those looking to reinforce their home’s cladding and protect their home’s exterior from storms.